- 1 bedroom with convertible 140. - typical sites: republic, bastille, father lachaise, belleville, menilmontant within 15 minutes on foot. 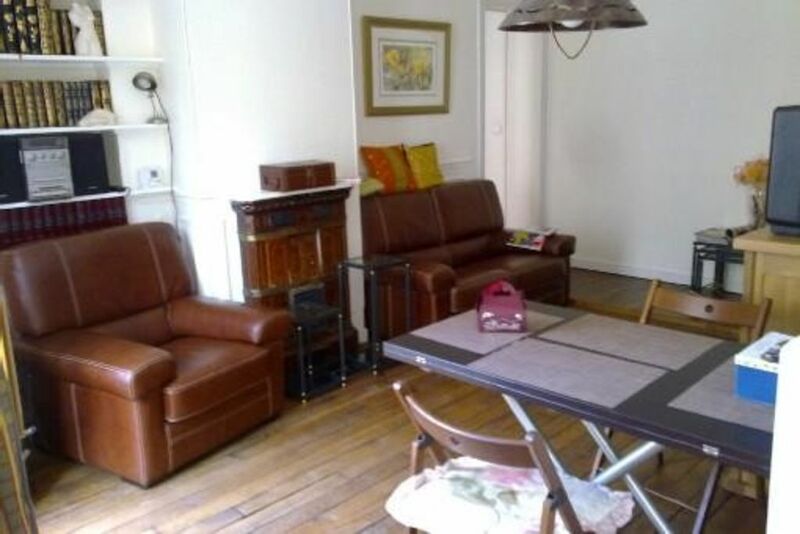 We felt very comfortable in this apartment, which was quite spacious by Parisian standards. We really enjoyed the view from the windows of life around us, where there was always something happening. Its location was excellent, and with the Metro stations so close, it was easy to travel to anywhere in Paris. Although the bathroom was a bit limited, the kitchen was well equipped, and the beds very comfortable. We were particularly impressed with the warmth and helpfulness from the owners. The apartment was very nice. Two bedrooms, comfortable living room, a bathroom with tub, and a well equipped kitchen. The apartment is very safe and secure with two electronic security entry doors to the building and large metal door with double lock dead bolt. Mr. and Mrs Christian were waiting for us and were very friendly. They gave us a complete tour and made us welcome. There is a bus stop across the street and Bus#96 takes you right to Note Dame and the Latin Quarter. The only problem we had was that people would be noisy in the street. Otherwise, we enjoyed our time here and would like to return. This apartment was great for my family. Convenient location to the Metro and bus. GREAT eateries around the apartment. The owner is super nice and was easy to work with. If we come to Paris again, I would definitely stay here. I liked the fact we were among the Parisians and not in a tourist area. Side note, there were construction going on so it was really loud in the morning. Un grand merci pour cette appréciation. Nous sommes désolé pour les désagréments concernant les travaux de rénovation de la cour de l'immeuble. Si vous désirez revenir sur Paris, c'est avec plaisir que nous vous recevrons. This spacious and exquisitely maintained apartment is located in the 11th Arrondisement but is really conveniently located to reach all of Paris easily. Bus 96 stops almost at the front door and connects you to stops on its way to the Gare Montparnasse in southern Paris. Metro Line 2 is a 2-minute walk. Metro line 3 is 5-minutes walk. You are less than one mile from Place de la Republique in one direction, same to Pere Lachaise cemetery in another, and one mile to Place Bastille in another direction. You can walk to the Louvre Museum in 30 minutes. You are only twenty-thirty minutes by Metro from all of the famous Paris tourist attractions. There are scads of restaurants of every type of food in every direction just minutes walk away. It is an eclectic neighborhood that gives you an idea of what modern, not touristy Paris, is all about. The landlord and her agent are just wonderful, warm, and very helpful people. They are very accommodating and knowledgeable, also. Neither speaks English; however, but that will not be an issue and you will still be able to check in. The apartment has two large bedrooms, each with a queen size bed (though one is a sleeper sofa type fold down). The bathroom is large and modern but there is no shower. The tub is big enough for two and is equipped with a spray nozzle meaning you have to kneel or sit in the tub to rinse off. Easy to use and very efficient. Lots of towels and sheets are provided. There is a well equipped and modern kitchen with a large refrigerator and real freezer. There is a four burner electric range with an oven. The living and dining area is large with windows that overlook the small square outside. You can sit at the dining table and watch a veritable parade of people of numerous cultures walk past every day, including samples of all of the latest fashions that Parisians are wearing today. This apartment is on the first floor so you will have to walk up about 16 steps but the steps are wide and easily managed. This apartment is perfect for everyone except someone in a wheelchair. Words cannot fully express how much I enjoyed my stay in this hidden gem! Monsieur Codelfy was kind and gracious, and made sure to give my cousin and me a full break down of the apartment and the city of Paris. Really, this was way more than we bargained for in such a good way! Even though our French was not up to par, Monsieur Codelfy was still so nice, really I cannot stop saying it. About the apartment: It is huge! Sleeps 4 easy. It is located near a metro station, and I’m pretty sure a bus runs near there as well. There is also a bike rental unit right across the across the street. Even though it may seem a little off-center, it isn’t. In Paris you can get anywhere really within minutes because of the Metro system. Or you can take a cab, or UBER. This apartment is highly recommended. It’s clean and nice, and the area is safe. Oh! Oberkampf is only a street away so make sure to check that out. It’s a pretty hip area. Excellent apartment in popular location! What an amazing apartment! My cousin and I were shocked to see how spacious the apartment really is. Very roomy with plenty of space for 4 people. For two, it seemed like a palace! All areas were clean and well stocked with necessities such as towels, toiletries, bedding, cookware. The windows face the street and provided lots of natural light. Details and certain touches like the books throughout gave the space character and a warm charm; it made me feel as if the owners had just stepped out of the apartment on a quick errand and would return at any moment! Located on the first floor of the building, the apartment is situated above a bar a laundromat. The bar serves great lunch and dinner and gets lively evenings on the week-end, although noise was not an issue for us from the bedrooms. Conveniently outside the apartment are various restaurants, bars, shops, and places to eat. Oberkampf is a very popular and hip neighborhood full of restaurants and bars and is only one street away! Bus line 96 stops right outside the apartment and runs directly into the center of Paris, and metro stops Couronnes, Ménilmontant, and Parmentier are all nearby. Although our flight was delayed into Paris, the owner who received us could not have been more welcoming and kind. After helping us get our luggage inside, he spent 40 minutes (!) giving us a walk-through of the space and giving general information about the city. He did not speak English and although our French was not very good, he was patient with us and we were able to communicate very well. We felt like family! Between the great location, the service from the owner, and the apartment itself, this will by my first choice accomodation for all returns to Paris! Le montant des arrhes est fonction du montant du séjour : ex : 120€ pour 320€, 150€ pour 500€. Le montant est fixé par le propriétaire au moment de la demande.